On the night when Ireland lost the world cup cos of a certain Frenchman’s hand, I was engulfed in the whirlwind that is Mark O’Rowe’s Terminus. 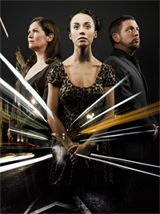 First produced in 2007, the plays returns to its birthplace on the Peacock stage. It was a good sign that there was a picture of Marina Carr’s Woman and Scarecrow on the wall of the bar when I arrived – good productions encourage more good productions. The play is a wonderful, rhythmic trip through the interlinking lives of three characters in the space of one day – almost like a contemporary Ulysses really!!! While Andrea Irvine remains from the original cast, Karl Shiels and Kate Brennan are welcome additions. In particular, I felt Kate Brennan was undeniably brilliant with a stunning delivery of perfectly timed rhyme. I found that when her turn came round to pick up her story, she really took us all off on a real whirlwind story, flying through the air and plunging back down into the depths of the earth with her fantastical, creature lover. The play is a real treat and a wonderful escape into a truly horrifying but captivating world – pure escapism that won’t leave you for days after. Runs until December 5th – don’t miss it for the second time!! Good blogpost, good looking blog, added it to my favorites.